Do you have a fabric with a large print or one you just do not want to cut up? Then this pattern is for you. You will learn to how to make bias tape, bias trim, work with bias fabric and curves. The techniques are a little different than the quilt-as-you-go previous table runner class. 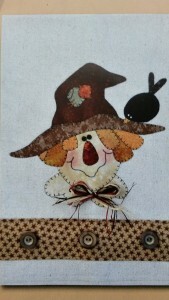 Both the runner and place mats will be great with Holiday fabrics. I enjoy decorating for the Holidays and making things to decorate with. During the summer months I decorate Patriotic; red, white and blue. This runner is easy piecing and easy to assemble. It looks great on your table whether you are having a party and/or barbeque or not. These rugs have become one of the hottest new things in the quilting world! 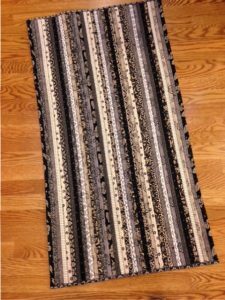 Turn 2 1/2 in strips into a beautiful 32" x 42" area rug. Learn how to prepare the strips with batting, then by using a simple zig zag stitch on your sewing machine, join together your strips to create a one of a kind rug. A simple binding on the ends gives your rug wonderful finished ends. Every quilt can have a matching rug by cutting all your quilt scraps into 2 1/2 strips! 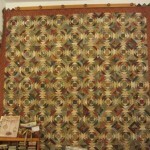 Or grab one of those jelly rolls that are in your quilting room waiting for a project and create a beautiful rug! This thread catcher and organizer is a “must” for every sewing room and every sewer. Whether you sew by hand or machine you will have things at your fingertips. This class will not only teach the construction of this thread catcher but also how to use iron-on vinyl. This makes it easier to clean out those threads. Make one for yourself or what a great gift for your sewing family and friends. Also see the matching “Pockets to Go” class. I am sure you will also want one of those for your sewing room. 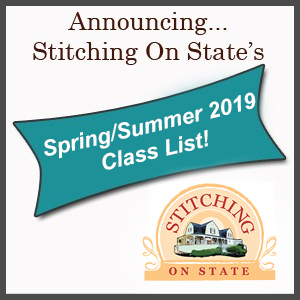 Make new friends and learn a new skill when you take start quilting at Stitching on State. 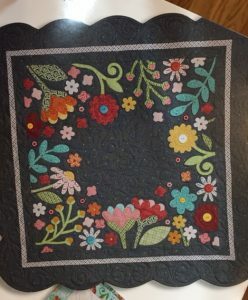 Over the course of five weeks you will learn everything from basic rotary skills, strip piecing, simple machine quilting, to putting a binding on. You will work on three small projects. 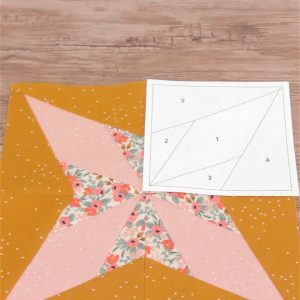 Learn how to make a simple rail fence, a nine patch checker board, then learn to make half square triangles and flying geese to complete a beautiful original table runner. 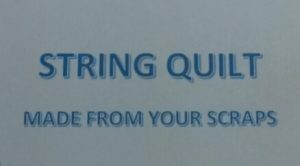 This is also a great refresher for anyone wishing to fine tune their quilting skills. 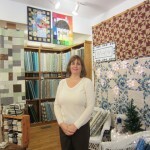 Come join the wonderful world of quilting! Learn the basics of paper piecing and open the door to the possibilities this wonderful technique brings to your projects! 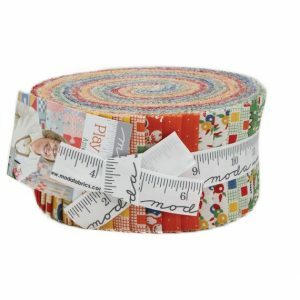 Turn your jelly roll strips into a beautiful trivet that would look great on your counter or table. Learn how to wrap your strips around batting, then sew the long tube into an oval trivet using a simple zig zag stitch on your sewing machine. It is really quite easy. Once you learn this technique you can make beautiful oval rugs by simply adding more fabric strips and batting. So grab some 2 1/2 inch of fabric from your stash and join the fun. 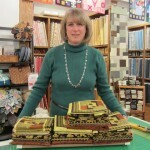 Have you ever been intrigued by beautiful Bargello Quilts? Would you like to learn more about them? Come join us as we show you, step by step, how to complete your very own Bargello Quilt. Our expert staff is here to help you design the perfect color palette. Please bring a brown bag lunch to this session. Come learn how to turn your fabric scraps into a truly beautiful quilt using the Trash To Treasure Tool. This tool/ruler is easy to use to create perfect 8 inch finished pineapple blocks. You will be surprised to see how easy it is to create different looks by working within a color theme or by simply adding sashings. Plan on spending the day at Stitching on State playing with your fabric. Lunch will be served, so all you have to do is sew, sew, sew. What fun is that! Do you have any scraps? Not sure what to do with them. Well, let’s make a quilt. 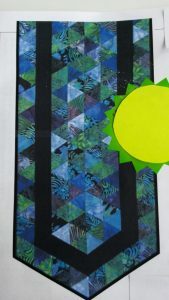 In this class you will learn a couple techniques on how to make a string quilt and how to assemble them. Also see my Crazy Patches Quilt Class where you will learn a completely different technique on making that string quilt. 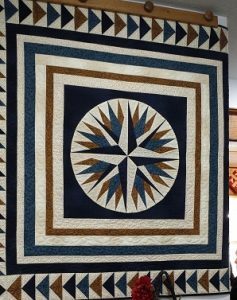 The Mariners Compass in this outstanding quilt is paper pieced. Paper piecing allows you to have sharp precise points. Create the center of this for a table topper or incorporate it as a medallion as in the Greenwich wall hanging. Skill level: Previous paper piecing experience. 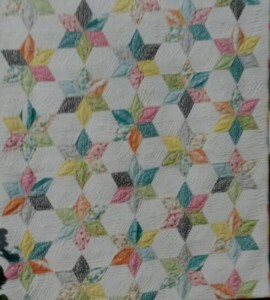 This quilt is one of the String Quilts I am teaching this quarter. 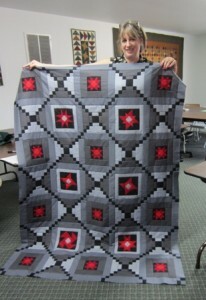 In this class you will learn a fun easy technique on how to make and assemble this quilt. Also see my Scrappy String Quilt Class. You will learn a completely different technique and you use “your” scraps. Besides my sewing machine and my fabric, this is my favorite thing in my sewing room. I like having everything at my fingertips when I sew and this cubed pocket holder organizes and holds everything I need. You will learn the construction of the organizer and it is not hard to do. 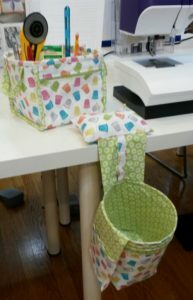 You can take this organizer to class or just leave it by your sewing machine. Also see the matching “Thread Catcher Plus” class. I am sure you will also want one of those for your sewing room if you don’t already have one. I love both of mine. Your table will be in full bloom with this beautiful table topper! Using raw edge applique techniques you will create this bright and cheery 28" x 28" center piece. During the second class date you will learn how easy it is to cut out the unique scalloped edge that I love! Learn how to cut and sew on the bias binding. Just sew on some colorful buttons (using your sewing machine of course) and you will have a true work of art. 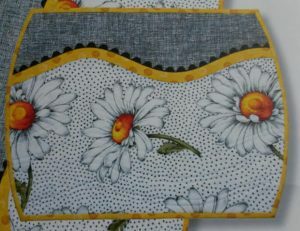 You can make this beautiful table runner as scrappy as you like with as many different fabrics as you like. Even the pattern states this runner is perfect for using your leftover Jelly Roll Strips. Whether you use your pre-cut strips or a combination of different fabrics you will learn how to work with bias cuts to make with beautiful table runner. Let us walk you through every step of the weaving process. During class we will complete a woven wall hanging. Want to know how to appliqué using the Raw Edge techniques? This course concentrates on different stitch techniques for machine raw-edge appliquéing. You will learn about needles, threads, tensions, machine settings, stabilizers and fusible web. You will also practice on different shapes using your zig-zag, satin and/or blanket stitches and do a small project from start to finish using your new appliqué techniques. Do you have a pile of quilt tops just waiting to be quilted? Not sure of how or where to begin the quilting process? Here is the perfect class to learn how to quilt your own quilts at home on your sewing machine. Learn about needles, thread, batting and marking tools. The first day of class covers machine guided quilting using your walking foot. The second day of class you will put on a darning foot and learn just how easy it is to do free motion quilting. 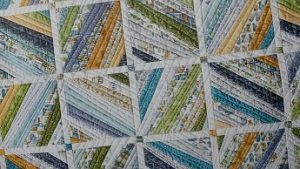 This class will help you to develop the confidence needed to quilt your own quilts. 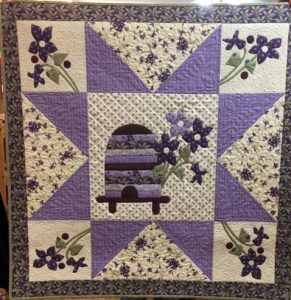 I fell in love with this charming beehive and violet 36" x 36" table topper/ wall hanging. Being a pattern by Jan Patek I felt the edges needed to be turned under, therefore this is the perfect quilt for mock hand applique! All the look of hand sewing, but done using a blind hem or zig zag stitch on your sewing machine. Learn how to prepare your fabric pieces using stick and peel paper ( this product allows you to leave the paper inside the quilt ). Learn to use a bias tape maker to create your flower stems. Then using your sewing machine and invisible thread or wonderfil machine sew all your pieces onto a simple pieced background. This will be a beautiful addition to your home decor! 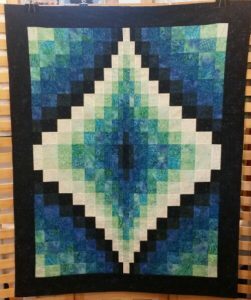 In this class you will learn the technique on how to make a Bargello Quilt. I will also show you my favorite way to make your squares meet together. This size quilt can be a wall hanging or is the perfect size for a baby quilt.